I’m a fan of Jonathan Dove’s music; I’ve heard quite a lot of it, mainly his vocal music, and have enjoyed what I’ve heard. Equally, I have been very taken with the singing of the British mezzo, Kitty Whately, and all the more so since hearing her outstanding debut CD, This Other Eden (review). So the combination of an admired composer and an admired singer on the same CD was irresistible. In complete contrast, the song which opens the recital, My Love is Mine, speaks of love in a very different way. The text is from the Song of Songs and the piece is unaccompanied because it was written to be sung at a wedding in a Quaker meeting house where no musical instruments are available. In his very good booklet notes Julian Grant describes the song very accurately as “a joyous and touching monody with an occasional melisma.” It is wonderfully expressive and I can only describe Kitty Whately’s singing of it as sensuous. rise to impassioned climaxes. Prior’s My Heart Still Hovering sounds for all the world like a love song – but there’s a twist in the tale. All These Dismal Looks sets sardonic words by Lady Mary to suitably pithy music. All the Future Days is a set of six poems by Ursula Vaughan Williams: all are either about or portrayals of women. I like these songs very much indeed. The second, Autobiography, has an ardent vocal line, most expressively sung here. Meanwhile the vocal line is underpinned by a constantly rippling piano part. Best of all are the last two songs. First comes Martha, which concerns the sister of Lazarus in the New Testament story. Martha was pictured in the Gospels as one of life’s ‘doers’ but here both the words and the music express admiration for her steadfastness and application. It’s a very fine song. So, too, is The Siren. The poem tells of the woman who had an intimate relationship with an Angel and then was condemned to sing and mourn his death forever. A huge piano introduction sets the stage for a passionate song which ends with an ardent vocalise. Kitty Whately and Simon Lepper give a compelling rendition of what is, I should imagine, a very demanding song to perform. Cut My Shadow consists of three settings of poems by Federico García Lorca (1898-1936) in English translations. These poems are literary strong meat. The first, Surprise, is an outpouring of grief for a murdered man. Dove has made a no-holds-barred setting of which Whately and Lepper give a vivid account. Guitar, which is a lament, starts off in a mood of what I might term tense tranquillity and becomes more and more impassioned. The set concludes with Song of the Dry Orange Tree: here the music is angry and angular. These aren’t as appealing as some of the other songs on the disc – which is understandable in view of the subject matter – but, my goodness, they make an impression. This programme contains many very fine songs. Dove’s music has great appeal, even in the Lorca settings which are more uncompromising. He’s a genuine melodist and these compositions prove that he has a discerning eye for a text and that he is capable of enhancing his chosen texts through music. The vocal lines consistently compel attention and the piano parts expertly complement the melodic line. It’s hard to imagine that the songs could be in better hands. Kitty Whately sings this varied programme with consummate skill. Her diction is extremely clear and the tone is simply gorgeous. Her voice has a lovely top while the middle and low registers are rich, full and warm. She has a great ability to put over a song expressively and I found that she grabbed my attention from start to finish. This new album is further proof that this gifted singer could – and should – have a very big career. Simon Lepper’s pianism is no less admirable. He is highly supportive of his singer and ensures that the piano parts always make their full effect. The technical side of the recording was in the hands of Nigel Short (producer) and Dave Rowell (engineer). They’ve done a fine job in the pleasing acoustic of the music room at Champs Hill, not least in balancing the singer and piano expertly. This is a very fine release. 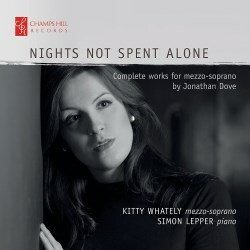 Kitty Whately comments in a foreword to the booklet that Jonathan Dove’s songs aren’t performed nearly as much as they should be. Well, with advocacy such as this surely that will change. Kitty Whately and Simon Lepper will be appearing together in rectal at the Three Choirs Festival in Worcester on 28 July. Their programme will include the premiere of a new work by Sally Beamish and a generous selection of Jonathan Dove songs from this disc, including Nights not Spent Alone, My Love is Mine, Five Am’rous Sighs and The Siren from All the Future Days. Details here.